The Royal Enfield Himalayan is a dual-sport motorcycle that reflects the ethos of its Indian manufacturer. It’s a low-cost, basic, no-frills ride and its performance won’t leave you gasping for breath. But it’s comfortable, handles well and is a good fit for a particular mission. That mission would look something like what its riders in India might expect it to execute; crowded city driving, with more adventurous riders perhaps escaping the sweltering heat with a ride into the Himalayan mountain range. You won’t be hanging on for dear life under acceleration — the 411 cc, air-cooled single cylinder makes just 25 horses at 6500 rpm with a claimed 23.6 lb.-ft. (32 Nm) of torque at 4250 rpm. Acceleration is on the gentle side, making freeway on-ramps an exciting exercise. Dual ABS comes standard, with disc brakes front and back. Famed British company Harris Performance (now owned by Royal Enfield) designed the chassis and its heritage shows in the compliant off-road handling. Combine an upright seating position, a comfortable seat, a manageable 31.5″ (80 cms) ride height, a docile powerband and brakes that don’t grab and you have a ride that makes off-roading a fun day for anyone who’s not in a big hurry. And one final number, a number that might sway a lot of potential buyers — the Royal Enfield Himalayan comes with a shock-free price tag of $4499 in the United States. 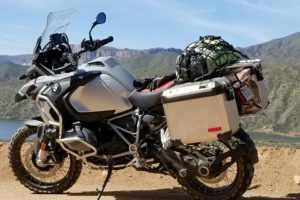 It’s a functional, well-behaved, relatively inexpensive entry point into the world of dual sport riding.